Yep! It’s true once you grasp a serious hold of life you realise how beautifully painful and challenging living really is. Life is sweet, glorious and joyful. Life is sharp, deep cutting and harsh. It is a balance and if you tread carefully enough you can rejoice in the true riches of Living. Once you are opened…there is no escape just embrace. A wonderful discovery that really works in that time of need! Fresh or dried Rosemary will completely transform you in under a minute. Take a small amount of Rosemary and chew on it, move it around the cheeks and across the tongue until the taste in your mouth changes. It can then either be swallowed (preferably) or discarded. This method is far healthier than and lasts as long as, if not longer than, conventional breath mints or gum. It is pure and free of dangerous and artificial additives. Simply carry a small amount around with you and it will freshen your breath leaving a great taste. 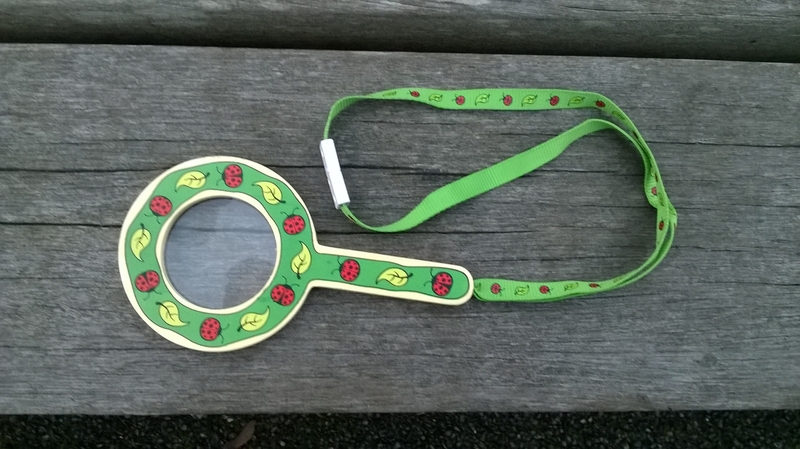 Another wonderful adventure to the woods was certainly afoot after my Sons’ Aunt gifted these amazing eco toy magnifying glasses to them. How adorable are these! 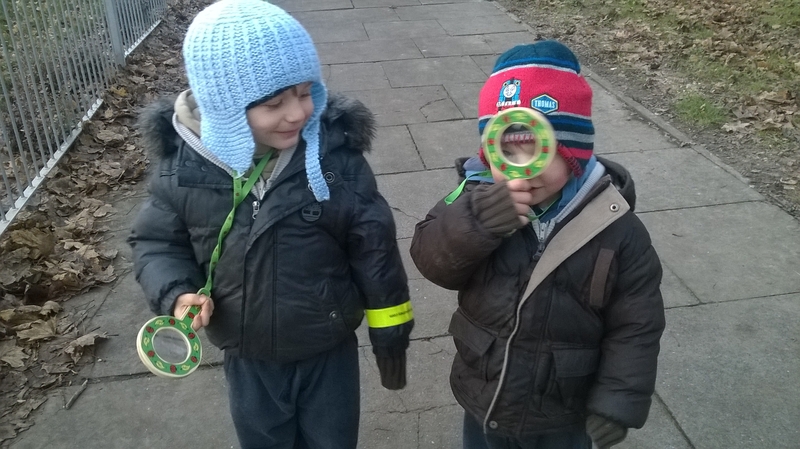 We all wrapped up ready to embrace the cold then we clipped together the new lanyards and I hung them around the boys’ neck ready to zoom in on nature. 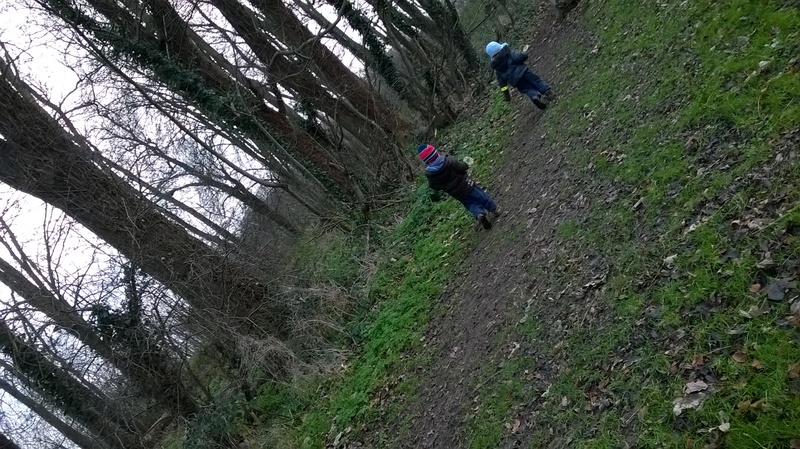 They absolutely love their new gifts and the boys made the most fabulously cute little explorers I have ever seen! Down the path glorified by Norway Maples we began our expedition. What would we find? 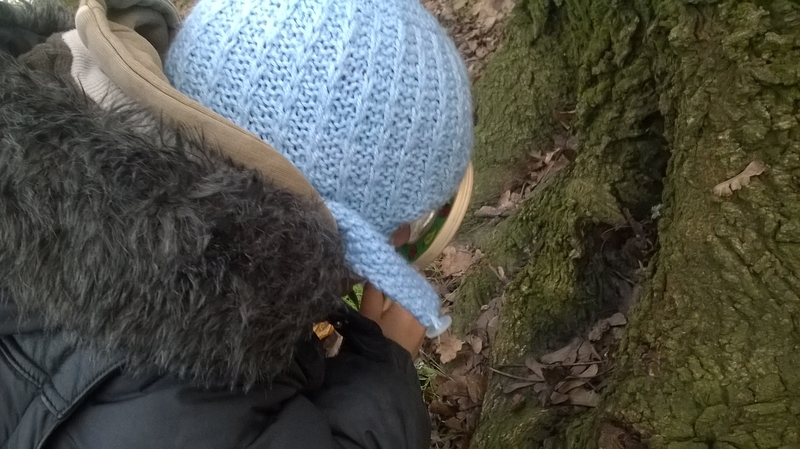 Before we had reached the entrance to the woods we showed some love to the Maple trees that had breathed us life for the past year and whom stood ever humble as the last of their leaves were swept away by the fast approaching chill of Winter. 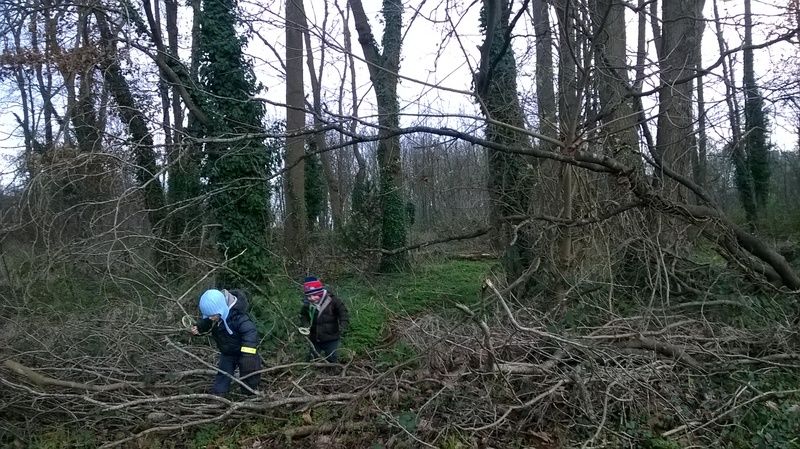 It was definitely fascinating for the boys getting a close up of the huge roots and of the overgrowing tree stump belonging to the old tree we watched being felled back in the Summer. There was also some beautiful leaves and green moss to be examined which looked awesome magnified. …and onto the Ivy lands! 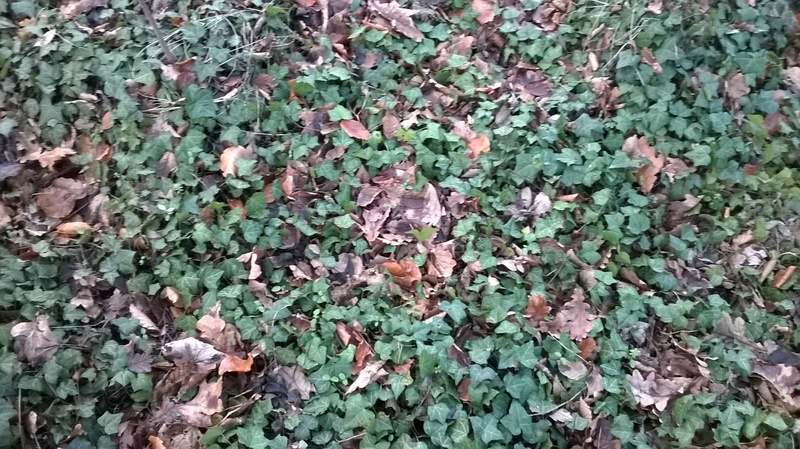 The ground below our feet overlaid with Ivy and a coating of dried crisp leaves was a welcomed change in texture. It was captivating to acknowledge how the Earth uses different life forms and materials to blanket itself. After passing under an archway of trees that seemed as if they were reaching across trying to gain closure of the woods from the construction site, we took a mini bypass. 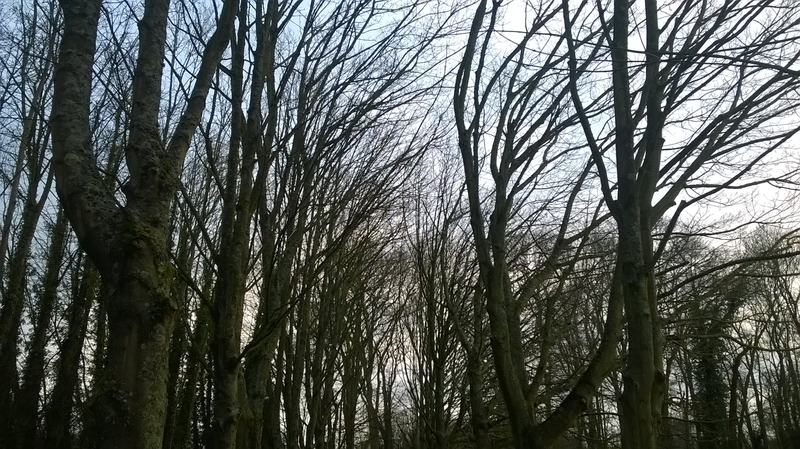 Back in the baby forest we were greeted by a grand presence of majestic trees. The boys are always amazed by the sheer size of these wonders (me too!). 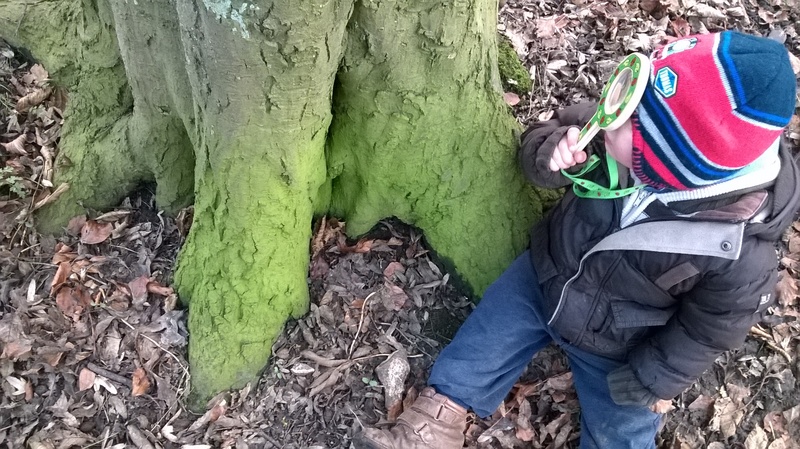 We admired the arches and hollows getting up close to inspect the algae and to take a deeper peek into the life of a tree! Through the woods we encountered some truly mesmerizing takes on nature when looking on a magnified level. 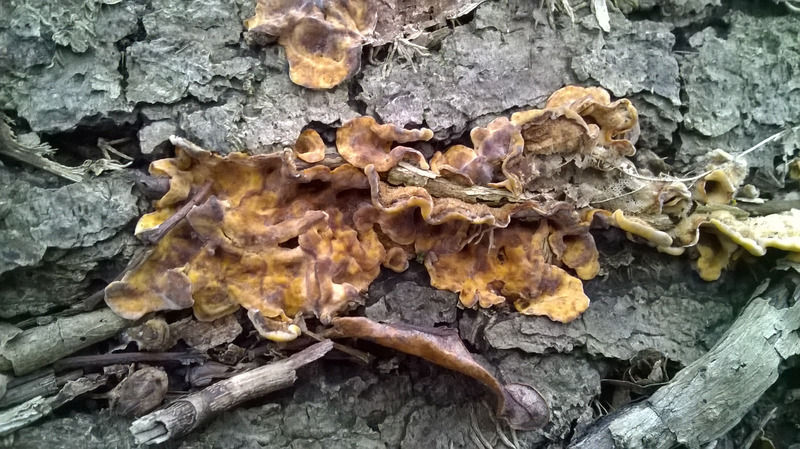 We found different fungi which were not surprisingly very beautiful when a moment is taken to fully appreciate the fine artwork that has actually gone into them. 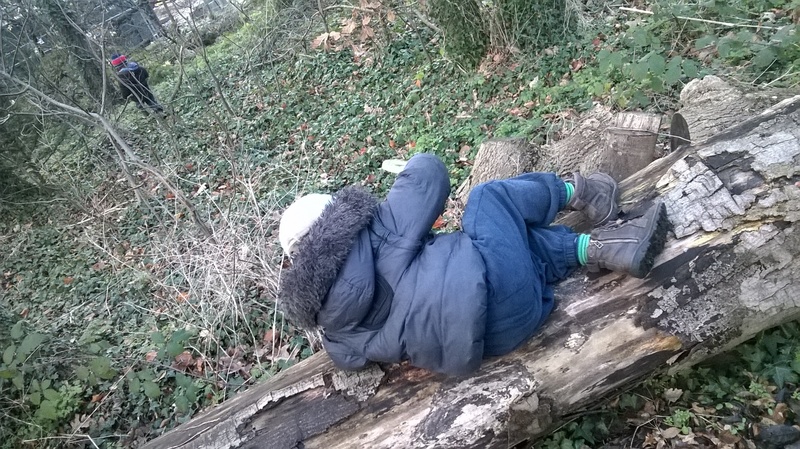 Next it was time to (carefully) lift up a log to to discover what lay beneath! There was not a lot to gaze at if I am totally honest, it must have been too cold for even the bugs to be out although what we did find was amazing. Wow! 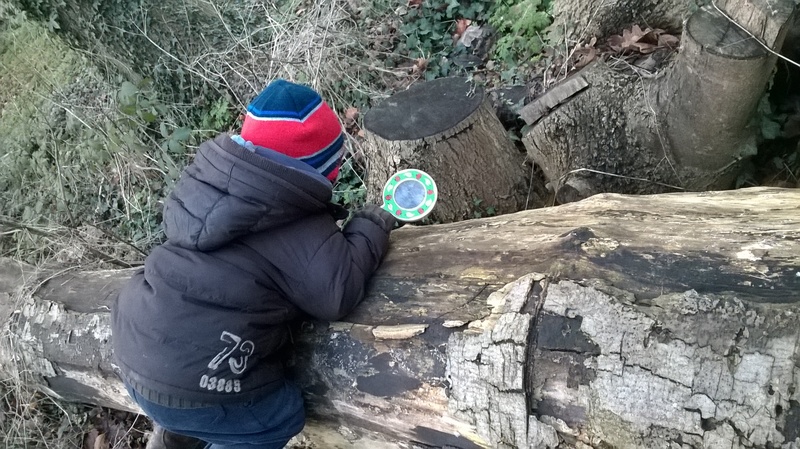 Upon lifting the old log we were instantly greeted by shiny centipedes which noticing us scurried away but not before I captured these pictures! 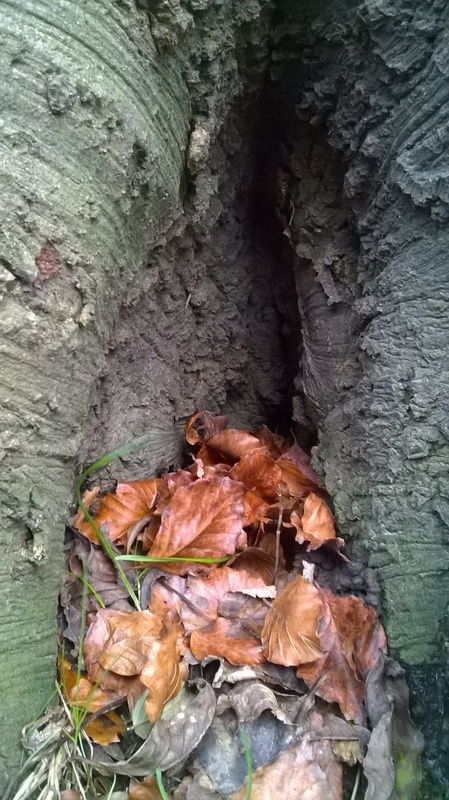 There were baby roots sprouting all around and a few woodlice that sadly escaped the photograph. 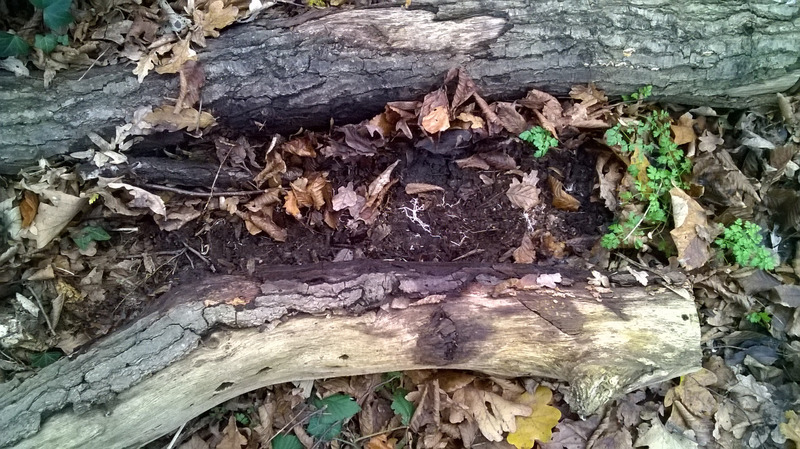 It was deeply fascinating for me to see the natural decay of leaves also buried beneath the log. 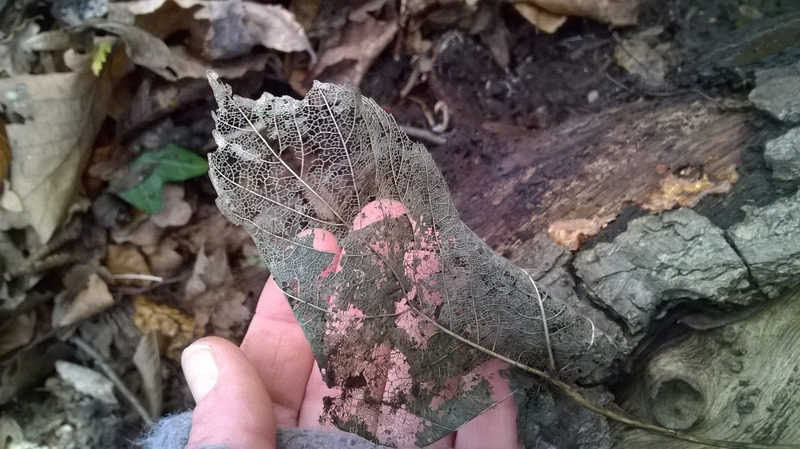 The leaves they were divinely pressed into the Earth’s surface, compacted into whichever they came into contact with by the above weight and it gifted me an awakened view to the nature of true biodegradable matter. 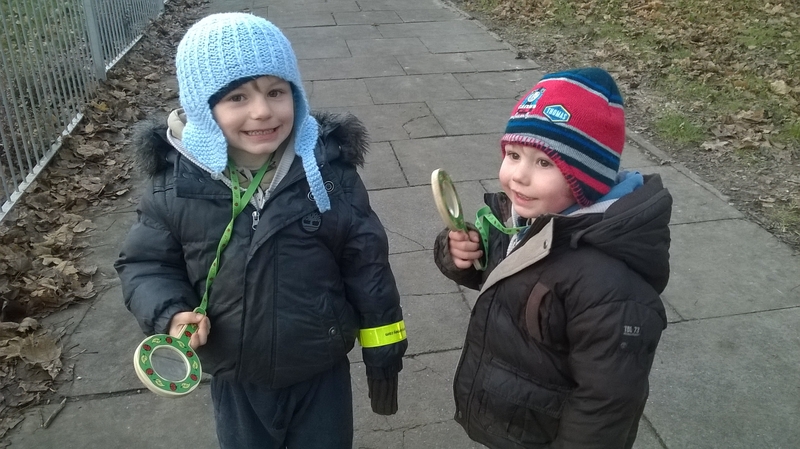 This is a great way for children to learn about nature by getting a closer view on it. It is an awesome starting point on how mini beasts live and about what happens down in the roots of life. 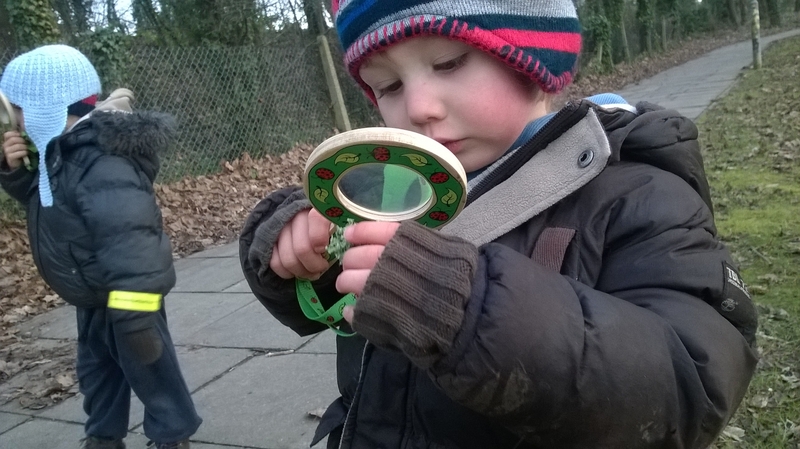 It turns a walk through the woods into a magical adventure for a child and as a parent I highly recommend you too get a magnifying glass and turn your child into an eco explorer ! A simply wonderful way to spend time outdoors. The truth about Brussel Sprouts! Brussel Sprouts are amazing! Most popular from Brussels, Belgium, they grow as buds on long stalks. They are beautiful and divinely created little superfood health bombs that are a true blessing to Humans. 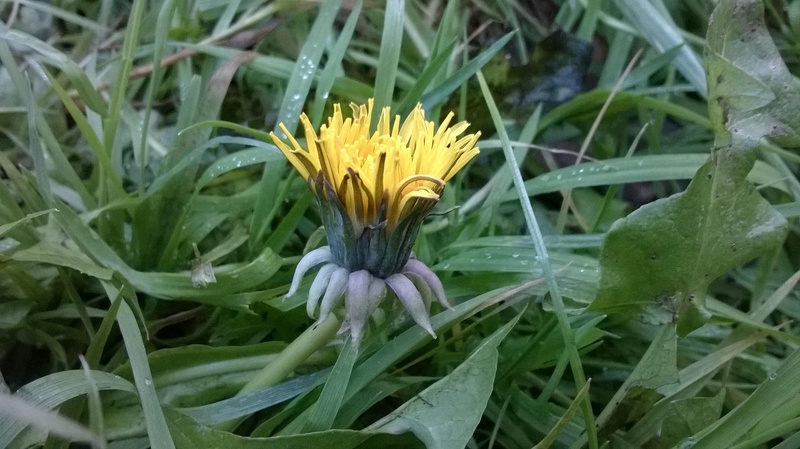 I am aching to get them in my garden as I keep hearing of the resilience these babies have to the cold, impressive! Cruciferous types of plants have sepals, flowers or / and leaves that hold themselves in a criss-cross style, Sprouts are certainly amongst these and they are green due to the pigment chlorophyll being present. I absolutely love the taste when properly cooked and it was not until a little while ago that I realised just how healthy they actually are…kind of seems we need these and other types of Green Vegetables to live well! I find the taste wonderfully unique and one of those that lights you up with a sense of true health. You can literally taste the righteousness! I know many people say they don’t like them but I wonder if they ever really cooked them properly in the first place. 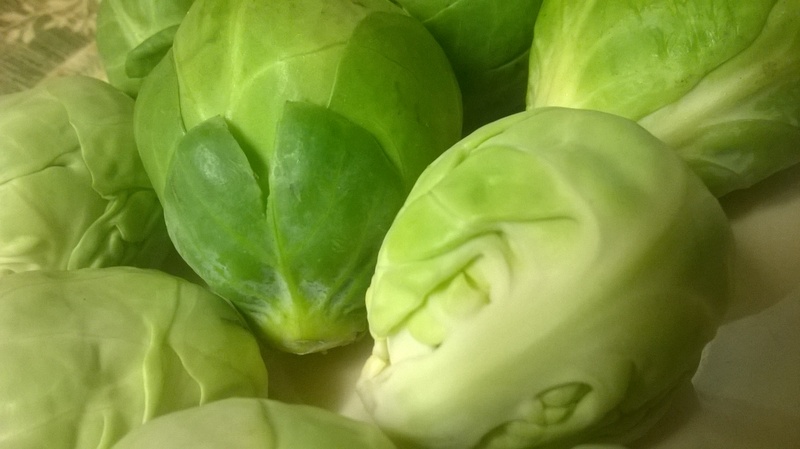 It turns out, after doing some research that if Brussel Sprouts are overcooked they release their Glucosinolates – which are organic compounds containing the substance Sulfur. Sulfur is the reason for the not so pleasant potent aroma often associated with members of the Brassica Genus. Glucocinolates are the main reason for the undeniable health benefits gifted by Sprouts, when glucosinolates connect with the enzyme myrosinase through acts such as chewing or food processing the food begins to produce highly reactive oils called isothiocyanates and these are reactive in the sense of fighting disease such as cancer, helping the tumours to breakdown. To cook them correctly gently steam for no more than 5 minutes, if you haven’t cooked them this way before I can assure you will be pleasantly surprised and hopefully totally hooked! It is found that 1 cup of Brussel Sprouts contains over twice the recommended daily amount of Vitamin K promoting correct functioning of our brains, bones and nervous systems. They also contains vitamins, A, C & E as well as some B vitamins. The vitamin K they contain aids in the decrease and prevention of inflammation and by regulating it this helps promote correct functioning of the cardiovascular system making a healthy person. They also contain precious minerals such as selenium, maganese, copper, potassium, calcium, iron, phosphorus, choline, pantheonic acid, magnesium and zinc. They are just bursting with antioxidants too and filled with protein. 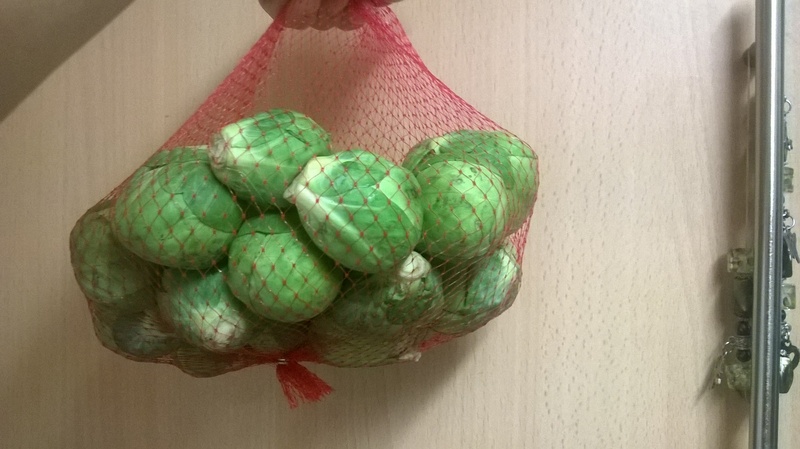 Containing a high amount of healthy fiber, Brussel Sprouts lower cholesterol levels. Fiber combines with acids produced from cholesterol that are used to digest fat therefore leaving less cholesterol overall. They also aid with digestion, promoting healthy bowel movements and helping with weight loss and maintaining a healthy body. I think Brussel Sprouts are great, I would happily eat them with any meal (they are particularly awesome with a squash coulis or sprinkled with nori!) They grow in abundance in the cooler months in Britain and seem to be part of our staple diets to keep us in good health throughout the Winter here. It is time to face up to the facts about Brussel Sprouts and choose to weigh in on optimum health for you and your family by eating them or other Brassicaceae members of the mustard family at least 3 times a week. Today I feel thankful for all my blessings as I do each morning that I awake. Today I feel very blessed and grateful to have the Sunshine beaming into my kitchen. It is a pure reminder that I am alive and if the true beauty of life and the real warmth of God. A sweet touch to help me embrace life. I have never seen it so sunny this time of year and it is truly beautiful (with an underlying thought of “maybe it shouldn’t be this hot in winter, what’s happened?”). I love rising to a sun lit day. Today I opened the doors and after slipping off my slippers I earthed myself in the tiniest patch of Sunny grass where my baby Rosemary is making her home and I prayed. I prayed for humanity to wake up and for the self destruction to cease, for needless hunger and homelessness to end. I apologised for the people’s ignorance and greed. I gave thanks for this beautiful day and held my face to the Sun with hope we can all see the light of respect needed for each other and our beautiful planet. All One. Getting Children To Eat Their Greens! I have noticed it is not only our spirits that are low at this time of year, our Vitamin D and antioxidant levels drop drastically from the lack of abundant fruits and sunshine. My children’s appetites are near non existent compared to the huge potato cakes they were eating in the summer. Seriously the amount they were eating compared to that they are eating now is enough to scare any parent! I was overjoyed when they were eating all the veggies via the potato cakes and thought I was onto a winner, I think they stopped enjoying it when I put beetroot in it and then my youngest fell into the habit of rejecting everything which has been a real struggle. Until the last few weeks, since starting the health conscious living plan over a year ago, the kids would not eat anything in a sauce, it was dry bread and toast, plain pasta, rice and noodles etc. It was really difficult to get any veg in them at all and I felt unable to find a way. One day we had a break through with rice, I started making risotto type dishes and they went down well for a bit until I used broccoli in it then they wouldn’t eat that either. I was literally pulling my hair out! Then I devised a plan to only use lightly coloured veg in the rice dishes as it could be disguised more, kinda sneaky but Mum knows best and these kids need their veg so using light foods such as Cauliflower and green Cabbage, Garlic etc and chopping it very very finely this worked for my youngest who really loved it, sadly for me this wasn’t good enough as it left 1 boy hungry still! My boys love Butternut Squash so praying underway I steamed and blitzed some squash and added it to a different type if noodles they hadn’t tried (optimistically hoping yet worrying they would waste yet more food) and to my happy surprise they both ate it. Quite often food is dismissed just on looks so I was happy this worked. It still wasn’t enough, I couldn’t remember the last time they ate their greens so next time I got a little cheeky and added Brussel Sprouts to the squash blend. Luckily for me the squash held the colour of the sauce and the sweetness overpowered the sprouts. Yes! Finally some real goodness getting in! Holding this method, the next time I did a rice dish I selected veggies of a light colour. Using the below method it was hardly noticeable there was even a sauce to the rice let alone vegetables in it. I am not so sure this would have worked with darker greens such as Kale as it would totally change the appearance leaving the plain rice loving child wondering what’s going on here, although I am happy for them just to have sprouts at least 3 times a week if no other veg!! Using an introductory amount of veg has proved a winner and next time I will use a good sized amount of sprouts for each child. With these amounts the sauce is tasty but not overpowering yet almost unnoticeable in appearance and will hopefully go down a treat. A little tip: I have noticed if my boy refuses this dish warm, I will let it go and then wait for it to cool completely and offer it to him again in perhaps a different room in the house. Each time he has finished the whole plate. This helps children acknowledge hunger and appreciate the food they do have. I know it is not wonderful table manners but if it gets the food in him and doesn’t harm anyone then I’m happy! Today I am thankful for my harsh upbringing! Being brought up in the way I had been was far from kind and loving but it has made me confident and tough, outgoing and decisive. I now know life is about strength in other ways as apposed to the physical type, strength of the mind in being supple. 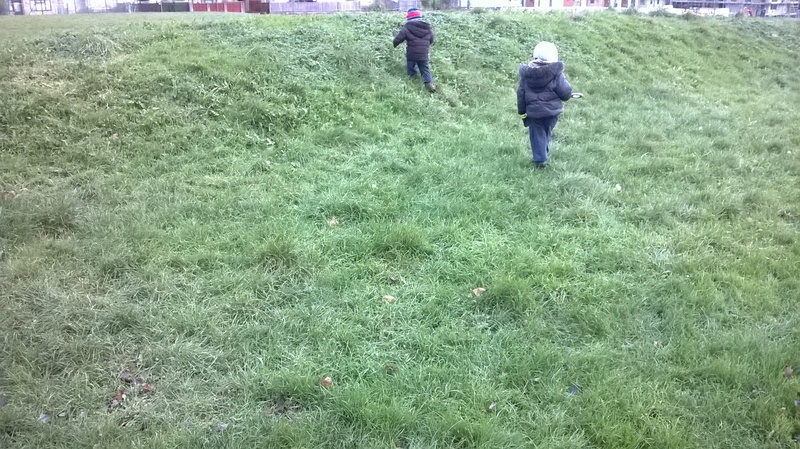 Although I believe these things I still believe there is much fun to be had and endurance skills learned from a bit of ‘rough and tumble’! When I was a kid I used to play fight with my sister and friends, family members would playfully throw us about and ferociously tickle the heck out of us in soft play and we had a great laugh! Before I was born my Father was a boxer in the army as were many other people I knew. As I grew up my friends and I through our school years would ‘spar’ and arm wrestle, play 2p knuckles, dead arm competitions, birthday bumps etc this was the norm to us and it was fun! I have danced at many parties with my head in the speakers, ears blasted off my head and bumping about into my friends, pushing each other in the bass and smiling, having a laugh! 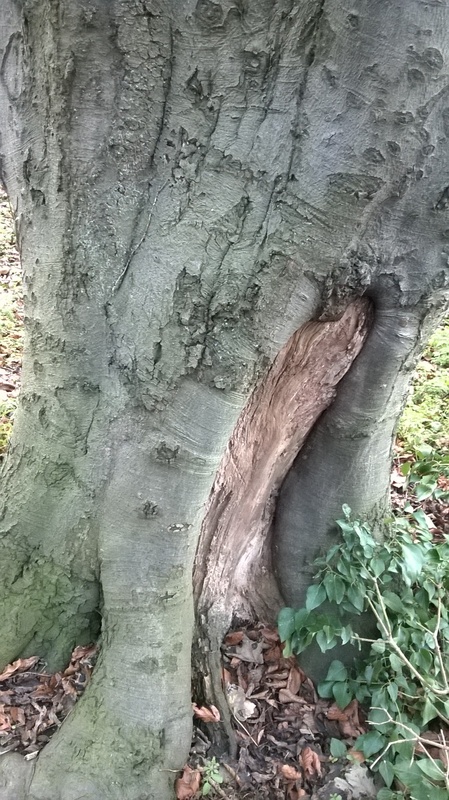 No harm done and in fact if there were ever the need or want to go on a heavy endurance course or to climb a mountain then I would feel ok about it as I grew up being bumped up trees, falling out of them, getting up and trying again! Heck if I ever needed to defend myself from an attacker then I am a little more prepared than some who think a tap on the arm is something to cry about! I mean seriously how are these people going to cope when someone knocks into them and doesn’t apologise? A truly righteous person never provokes war yet is always prepared for it as I said yesterday in this week’s Writer’s Quote Wednesday. There are many mean people out there and there are also many boisterous yet friendly people too and I am just grateful my eyes have been opened to that side of life as it has made me more susceptible to real world. For the last year I have been slowly trying out different unleavened breads and trying to find the healthiest ways to cook them. When you are a vegan that is intolerant to gluten, dairy, yeast, xanthan gum, artificial everything and sugar the breads available in the shop tell a new story of anti-health and the list of recipes available somewhat slims down leaving a person to use their own knowledge, experience and common sense to get creative with bread. I tried oven baked loaves and was not having much success and being on a tight budget I couldn’t afford to keep throwing bags of flour in the bin with trial and error so oven baked, unleavened bread became my best friend. For a while I was making flatbread in a pan, either dough ball or pancake mix consistency but I didn’t agree with the high heating the oil all the time when I knew it could be better and for a while I was stuck in a rut with it, although still knowing it was healthier than any bread I was able to buy. I mean really, when was the last time You saw buckwheat bread in a store? Learning to oven bake the flatbread (and it actually being successful) all started when I followed the an awesome pizza base recipe. From that I have made dozens of variations to finally have several I would be happy to share naming them healthy. I have got to the point where my children will eat this bread with anything added to it, for instance, they do not eat steamed Kale, Nori or desiccated Coconut in their own forms but are happy to enjoy my bread with those ingredients blended in. I have weaned my Boys right off adding any sweetners to the bread. For so long I was adding Agave Syrup not realising how it effects the glucose levels and I can now happily say we use no sweeteners in our bread. To me, many foods in our diet, such as fruits / seeds, seem to contain enough natural glucose of their own so the need to add more isn’t actually necessary and can be quite harmful to someone verging on the edge if type 2 diabetes or serious candida overgrowth. This week I have tried two new flours, Ground Almond Flour and Gram Flour and both are a hit. Preheat the preheat oven to 200C. Line a baking tray with parchment paper and pop it in the oven to warm up. Mix the dry food ingredients together very well. Next add 2 cups of water slowly stirring constantly, add the oil and mix thoroughly. Add another 1/2 cup of water and check the consistency once mixed well. You want it like batter. Thick and runny. Add more water if it doesn’t run. Add a little more Buckwheat flour if is too watery. Carefully remove the tray from the oven and scoop the bread mix onto it, spreading it out evenly. Put the tray back in the oven for approximately 25 minutes. When the time is done, allow it to slightly cool, score into pieces, cut and serve warm. Thick and filling healthy bread. How sweet is my friend! She truly is my Soul Sister, the best girlfriend anyone could ask for. Love! As a gift idea Natalie used her creative flare and thoughtful love to turn a wooden coat hanger into two Aeroplanes for my Sons! I was amazed at how they had turned out and at the originality of creativity in looking at a coat hanger and thinking “that’s an aeroplane”! I absolutely love the idea of reusing and upcycling and would rather this be the eco friendly ethics behind any toy gifted to my children and she knows it so I was overjoyed when I saw how much effort herself (and partner) put into making her idea a reality. I just had to blog this idea albeit not my own! I am also keen to try this out with the boys as the satisfaction in the upcycle seems very rewarding, the kids will love it! It is a fact that not everybody on the Earth is kind and has the World’s best interests at heart, in fact most people are out for themselves which in a way is the idea to a degree although treading on others to get what we want is not a very noble way to go about doing so. Having strength in listening to the voice in our soul will get us where we need always. Al is totally right with his quote and I support it fully. I believe history says Oden had his own version of the quote for a raging Thor too. No matter how kind and loving we are, to truly be able to protect ourselves we must be aware that we could be attacked, mentally or physically at anytime. I believe that acting the ‘big man’ supporting a cocky ego and looking for trouble / physical bullying / forced unwanted contact causes bad vibes and yields only pain later to come back as humility. Yet I also believe shying away from a little rough and tumble physical fun with friends or family can lead to physical weakness and loss of preparation for our physical world…oh there’s another saying…”You can’t wrap them up in cotton wool forever”…totally understandable regarding a fragile baby to protect its weak frame although if a child is strong enough to climb a tree or go down a slide isn’t it time to let them deal with the pain of falling over without ridiculously over-doing the comforting? This helps them with strength, well that is my experience anyway. I feel we should never start arguments or any kind of physical war with others, instead to use a higher self to accept and understand the problem and deal with it appropriately without pain. This will then naturally give us strength in difficult confrontational situations. I also believe in having enough confidence in our own beliefs to stand up for ourselves mentally and to be fit and strong in body to stand up for ourselves physically. It is like protecting yourself from all angles bringing us inner peace.